Our All-Terrain Vehicle Container (ATV) provides excellent storage and shipping capabilities for units with ATV’s. Simply drive your ATV into the container, strap it down, and close the container. Your ATV will be protected by a heavy-duty aluminum container constructed from 5052 and 6061 aluminum material. The container end walls fold down and convert into loading ramps allowing the ATV to be driven into the container. There are (4) tie-down rings that are used to secure the ATV into place. 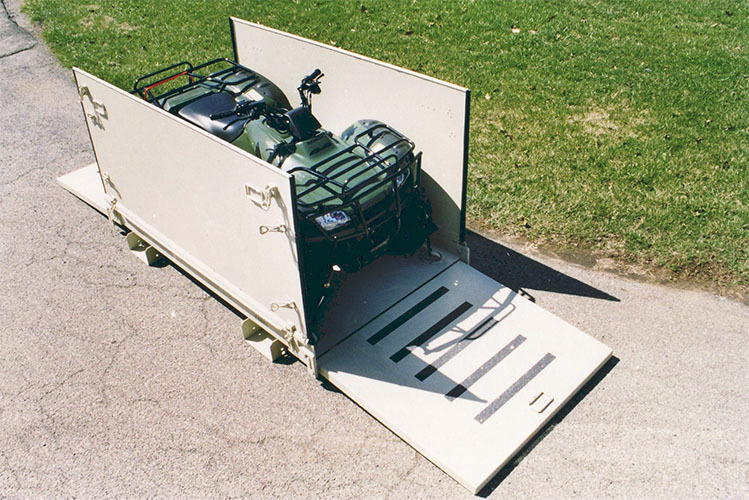 This container is four-way fork-liftable and can be loaded on all military aircrafts. When the container is not in use it collapses down to just 12 inches in height.